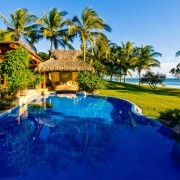 Caida de Agua is a luxurious private estate overlooking the famous Jack Nicklaus Signature Golf Course and the Pacific Ocean. 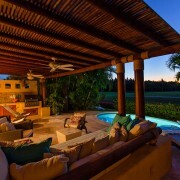 This lavish Villa is located within the famous gated Punta LPR Luxury Community, in Lagos del Mar. Your experience here will indulge your soul with magnificent views and warm ocean air. Caida de Agua means The Fall of Water, and is a description of one of the villas most prominent art features, a water fountain which greets you at the front door. 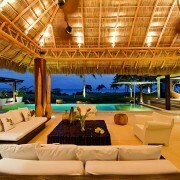 The water escorts you inside and ends by gently cascading into the spacious palapa covered open living room. This magnificent Villa is a celebration of modern Mexican architecture, providing quests with beauty, sophistication and comfort, in an exquisite setting of lush tropical abundance. Let your experience here be about pampering yourself. Our concierge will accommodate your every need to ensure your visit is full of leisure, comfort and adventure. Only guests renting from homeowners inside the gates of Punta Mita are able to access the world famous Four Seasons Jack Nicklaus golf courses, tennis club, and Resident’s Beach Clubs, restaurants, 8 miles of white sandy beaches, spa services, and other wonderful amenities. 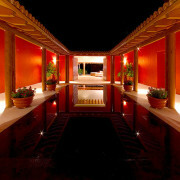 At this world class villa, you will also enjoy all the extras you expect from a five star resort.